When the NVIDIA GeForce RTX 20-series graphics cards were announced in August 2018 they promised to bring real-time ray tracing to PC games. After some unfortunate delays along the way we finally have the hardware and software to play Battlefield V with DICE’s DirectX Raytracing (DXR) reflections technology enabled. To get the realistic real-time reflections on surfaces and objects in Battlefield V’s single-player and multiplayer modes you’ll first need to ensure your gaming PC is capable of the feat. For that you’ll need the re-released Windows 10 v1809, which enables DirectX Ray Tracing functionality with DirectX 12. You’ll also need to update Battlefield V with the Nov. 14, 2018 update and be running one of the three NVIDIA GeForce RTX graphics card accompanied by GeForce 416.94 WHQL or newer drivers. DICE system requirements for those that are planning on enabling DXR in Battlefield V also state that you’ll want to be running something along the lines of an Intel Core i7-8700 or AMD Ryzen 7 2700 processor with 16GB of system memory. This means most gamers will be unable to enable Microsoft’s DirectX Raytracing (DXR) feature and that is okay. Real-time ray tracing is a very innovative technology that will change game titles for years to come. Enabling DXR is going to tax this first generation hardware as there will be a large performance hit enabling the feature. Just being able to ray tracing in games with a single GPU is impressive and is something we couldn’t even fathom happening just a couple years ago. This launch reminds us of when NVIDIA introduced the GeForce 3 series back in 2000 with a programmable pixel shader. Giving developers the ability to create per-pixel effects drastically changed the developer community and has helped make PC gaming great. To try out DXR in Battlefield V we built a test system using an Intel Core i7-8086K processor running on a Gigbyte Z370 Aorus Gaming 7 motherboard with 32GB of G.Skill DDR4-3200 HyperX RGB memory. We went with the fastest of the seven RTX series cards that we have and that would be the ASUS STRIX GeForce RTX 2080 Ti ($1399 shipped) and installed GeForce 416.94 WHQL video card drivers. A fresh install of Windows 10 Pro v1809 was installed along with Battlefield V on 11/16/2018 and all updated were installed. Our test system has an Acer Predator X27 27-inch 4K UHD IPS monitor with NVIDIA G-Sync HDR and a 144Hz refresh rate ($1799.99 shipped), so we enabled High Dynamic Range (HDR) as well as DXR and set the graphics quality to Ultra. The frame rate limiter to 200 and Vertical Sync was disabled. We then went down to the DXR Raytrace Reflections Quality setting and changed it to low. 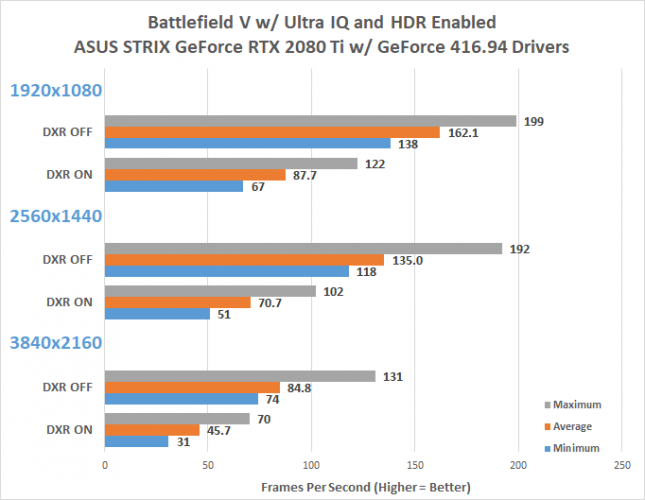 We went with low quality as that is what NVIDIA recommends using in this first release of DXR due to Battlefield V’s known issues when using “Medium”, “High”, and “Ultra” settings. NVIDIA didn’t elaborate what all issues it was seeing, but said that EA, DICE, and NVIDIA are working on more DXR optimizations that could be rolled out in game patches as well as NVIDIA’s regular driver updates. 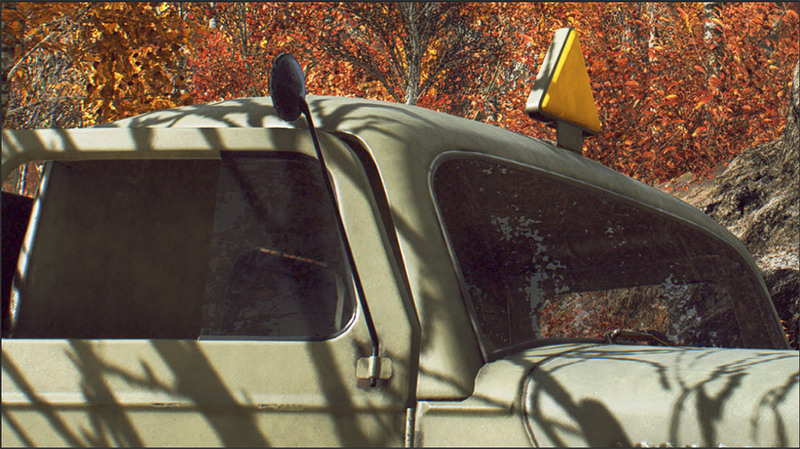 With DXR enabled you’ll be able to discover ray-traced reflections throughout the game. Most notably, puddles of water accurately reflect various structures, explosions, and fire. 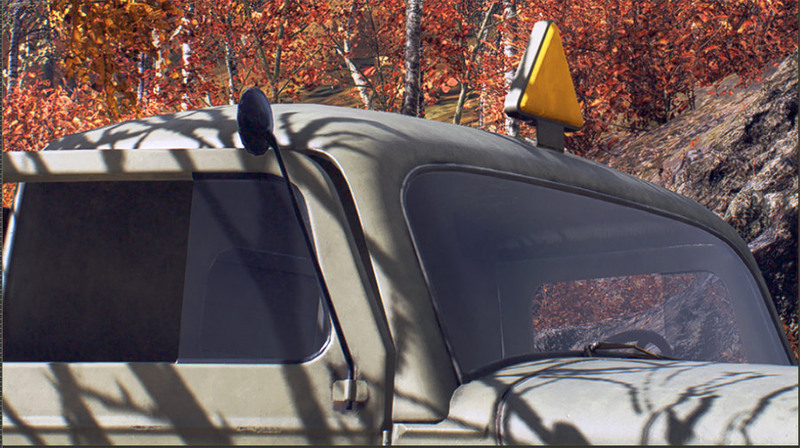 Ray-traced reflections are also visible on ice, military vehicles (mirrors and headlights), classic cars, and windows. Below is an example of the windshield and side window on a military vehicle on Tirailleur: Liberte. The first image is with DXR disabled and the second image is with DXR enabled on low. Notice that the windshield reflects the sun’s rays bouncing from the surrounding trees. It’s something that is easily noticeable when you look for it, but most of it will honestly goes unnoticed while playing. Enabling and disabling DXR requires you to exit and start the game again, so doing screen captures is fun. It should be noted that DXR only shows up on objects that normally show reflections, so when you are fighting in the forest you’ll not see any ray tracing unless you come across a puddle or glass. Enabling DXR bring subtle changes, but does help enhance the realism of the game. If you click on the image above you’ll notice that tree being reflected ‘breaks’ in a couple spots in the glass. Maybe the glass has some flaws, but it doesn’t look that that is being rendered properly. It should be noted that we did adjust the levels in Photoshop to better see this issue. Let’s take a quick look at performance. A quick look at average frame rate across on our GeForce RTX 2080 TI shows that enabling DXR certainly impacts performance. Our GeForce RTX 2080 Ti loses 46 percent of its performance under the Low Reflection Quality setting at 1080P. We saw similar drops of 48% at 1440P and 46% at 4K UHD. The NVIDIA GeForce RTX 2080 Ti with the Turing TI102 has the most RT cores of any RTX card and is seeing a 46% performance hit. These benchmark results might not look impressive, but this is the start of something new and exciting for the video game market. This is the starting point for ray tracing in games with NVIDIA’s new RT cores in Turing. 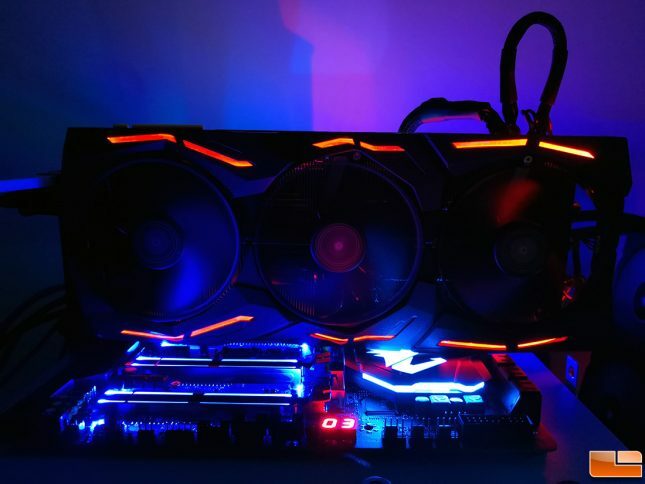 This is the first GPU architecture capable of real-time ray tracing in games and that something important to remember. NVIDIA has yet again expanded the feature set of their cards with technology that other GPU makers don’t have. It will be interesting to see when AMD and Intel will be able to have a consumer product capable of supporting DXR. Real-time ray tracing has long been considered the Holy Grail of graphics and this shows just how tough it is to do. NVIDIA has spent years on solving how to bring realistic reflections to games and we are finally entering that era. Real-time ray tracing is here to stay and will just a something enabled by default on some game titles a decade from now. NVIDIA is likely already optimizing its RT cores and it wouldn’t surprise us if they added more of them on its next generation cards.